In every branch of science, the “answers” change from year to year, decade to decade. To illustrate the point, let’s consider the up-and-down…and up again story of the humble coconut. During World War I, the coconut helped Uncle Sam keep his doughboys safe out in the trenches. Gas mask factories used the carbon from charred coconut shells to manufacture gas absorbents. The government even encouraged people in the US to use coconuts in many recipes so that the shells could be shipped to Europe for gas mask production. Then, during the Second World War, the coconut rolled up its sleeves again and lent a hand. It turns out that coconut water has the same electrolyte balance as human blood. Emergency transfusions with coconut water as a replacement for intravenous plasma saved many soldiers. The life-saving coconut also played a major peacetime role as an important component of the American diet. 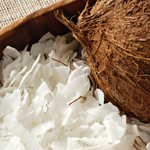 Coconut oil was a common ingredient in countless recipes. But by the mid-1980’s, the coconut became engaged in a very different sort of war — a war for market share against soybean producers. In 1986, the American Soybean Association (ASA) launched a take-no-prisoners campaign against coconut oil. Importantly, the ASA enlisted “scientific research” to wage its campaign. The ASA started “warning” the public against health risks associated with saturated fats found in tropical oils. Therefore, the health-conscious among us had to shun butter, bacon, steak, cheese, and most of the other good stuff that’s high in saturated fat…It was a very sad time. Coconut oil, according to the experts of the time, was the worst of the worst because it contains a very high percentage of saturated fat. All fats are composed of molecules called fatty acids that can be classified based on their saturation: there are saturated and unsaturated fatty acids. Coconut oil has a high content of saturated fats (92%), which is roughly six times higher than the saturated fat content of soybean oil. Maybe the ASA had genuine concerns for tropical oil consumers… Or maybe the ASA simply wanted to increase the sales of domestic soybean oil, which already accounted for more than 70% of all edible oils sales, and decided to eliminate the competition using a health angle as a smoke screen for a trade issue. The scientific data to back up the ASA’s claims certainly seemed strong at the time, emboldening other organizations to join the anti-coconut crusade as well. So successful were these attacks that coconut oil’s reputation deteriorated quickly from “health food” to dietary pariah. Across the board, health authorities and media began asserting that unsaturated fatty acids found in nuts, avocado, vegetable and fish oils, were the only “good fats” that could improve blood cholesterol levels, ease inflammation, stabilize heart rhythms, and play a number of other beneficial roles. Movie theaters began cooking their popcorn in soybean oil. Food makers and restaurants stopped using tropical oils and switched to soybean and other vegetable oils. By the mid-1990’s, coconut oil sales had plummeted. The Malaysian palm oil industry, the largest supplier of palm oil, tried to protest against what it termed a “smear campaign” against tropical oils, and even caused some advertisement claims to be withdrawn. But the damage was done. Coconut plantations suffered enormous losses and island nations of the South Pacific that depended on coconut for their livelihood went into a deep economic depression. But ASA’s about-face on edible oil labeling is not the only irony of our story. Here’s another one: By chasing coconut oil off of stores shelves, the ASA cleared the way for oils that contain the now-dreaded trans fats. “Healthy” unsaturated oils such as soybean and other vegetable oils are pretty unstable by nature and can go rancid rapidly. So manufacturers increase the shelf-life of these oils by using a hydrogenation process that turns the liquid oil into a more stable solid form (like margarine). But the hydrogenation process also creates trans fats, which, as it turns out, are much worse for one’s cholesterol levels than the saturated fats they replaced. We now know that trans fat consumption is associated with heart disease, diabetes and obesity. But here’s the ultimate irony of the coconut oil story: About ten years ago, the scientific community began backpedaling from the “saturated fats are bad” narrative. Several research teams published persuasive evidence that saturated fats were not so bad after all. Then, two years ago, a widely publicized report from the Oakland Research Institute demonstrated that there is no measurable connection between consuming saturated fats and the risk of heart disease. The report analyzed the findings of 21 epidemiologic studies that followed 350,000 people for up to 23 years. Researchers looked at the relationship between saturated fat intake and stroke, coronary heart disease (CHD), and cardiovascular disease (CVD). They concluded that there was insufficient evidence to link dietary saturated fats with increased risks of CHD, stroke, or CVD. Several other scientific studies corroborated the findings of the Oakland Research Institute’s report. Researchers in the nutrition field started to realize that not all saturated fats are created equal and began to understand that the size of the fatty acid in an edible oil matters. The vast majority of fats in our diets are composed of long-chain fatty acids (LCFAs). But coconut oil actually contains an unusually high percentage of medium-chain fatty acids (MCFA). And these fatty acids might actually reduce the risk of coronary heart disease associated with high cholesterol. A few studies reported that the combination of MCFA found in coconut oil increases the level of HDL or high-density lipoprotein (good cholesterol) and also increases the level of LDL or low-density lipoprotein (bad cholesterol), but does not seem to impact the ratio of the two. By contrast, trans fats increase the level of LDL and decrease the level of HDL, which negatively impairs their ratios. So when it comes to coconut oil, it seems pretty clear that that the scientific “answers” are changing. This formerly healthy food that became “unhealthy” may be on its way to becoming healthy again. In fact, several folks are touting the once-despised oil as a natural cure-all. Bruce Fife, a naturopathic doctor and nutritionist, has been leading public opinion into a complete 180-degree turnaround by writing a few books that praised the virtues of coconut oil. Not surprisingly, the Coconut Research Center has discovered some additional health benefits. Taking a page from the ASA’s playbook, the CRC lists over 50 health conditions that can be cured or alleviated by coconut oil, including hormonal and metabolic imbalances, viral infections and degenerative diseases. This natural marvel might also make you thinner or ward off the flu…or it might not. So should we trust Dr. Fife and the Coconut Research Center today more that we should have trusted Mr. Sokolof and the ASA a few years back? Or is the scientific pendulum simply swinging from one extreme to the other? The bottom line is that there is simply not enough evidence to substantiate any sweeping claims that have been made about coconut oil. The scientific community may have demonstrated that coconut oil is not as unhealthy as we once believed, but that conclusion is still a big leap from demonstrating that it is healthy. After she obtained her PhD in nutrition and Food Science at the University of Bordeaux in 2004, Severine Kirchner left her native France to work as a molecular and cellular biologist in the United-States. Her successive appointments as a research associate for the University of Medicine and Dentistry of New Jersey and the University of California Irvine allowed her to conduct research on the metabolic disorders diabetes and obesity. For more than 10 years she has had a keen interest in new technologies such as transcriptomics and stem cell biology that she studied firsthand in the lab.